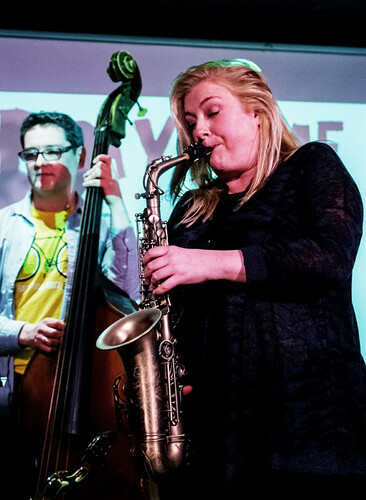 Last Thursday I went along to Playtime, my local bimonthly gig, as I often (but not always) do. Tom Bancroft pointed out that it was five years since their first show, and that seems worthy of note. I was at the first Playtime; quite a few were, although there has apparently been at least one occasion in the last five years when the band played to an empty house. I wish I’d been there – though then it might not have been noteworthy. Nowadays, they get good houses, often standing room only (stifling in the summer!). 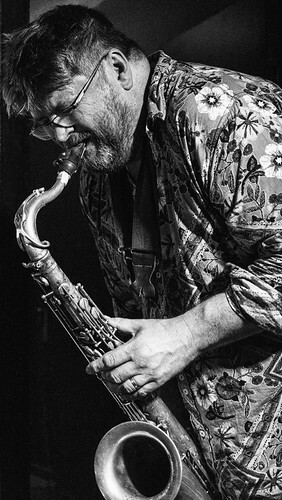 It started as a space for the four regular musicians – Bancroft, Martin Kershaw, Mario Caribe and Graeme Stephen – to try out new tunes, but it has become broader as they have sessions dedicated to specific influences (with new arrangements of well known tunes) and welcome guests from the lively Scottish scene and further afield, as musicians on tour stop by, and in particular, regular (and very wonderful) sessions of wholly improvised music. There have been many very memorable nights, and several absolutely magical. I can recall only one I was glad to hear only one set – I’d arrived late, in the interval, and I think if I’d seen the first set I might have taken the opportunity to leave during the break. But frankly one show I didn’t enjoy out of the fifty or so I must have seen seems like an excellent hit rate. 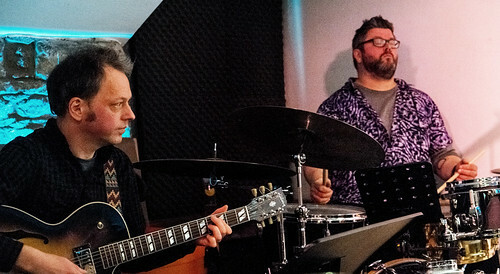 On Thursday, it was a return to their roots – trying out new tunes and arrangements. Unfortunately Graeme Stephen wasn’t there (off gigging with Sugarwork in Aberdeen), so it was a trio of Bancroft, Caribe and Kershaw providing the music. There were some lovely tunes – Bancroft’s “Occo In Scotland”, a piece written for a schools’ big band, and Caribe’s gorgeous arrangement of (I think) “Silenciosa”. 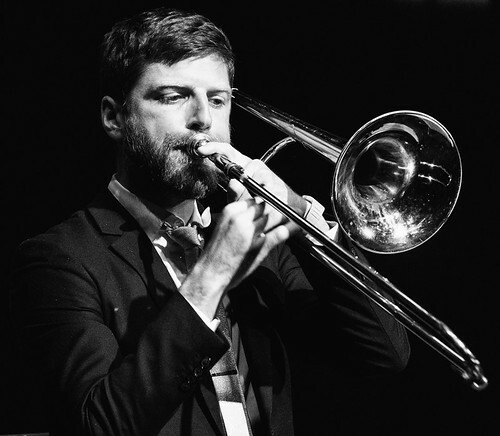 Kershaw presented some new reworkings of Strayhorn and Ellington tunes, the originals of “Take The S Train” and “Stain Doll” [sic] barely hinted at. There was a fair bit of politics, what with Brexit confusion and parliamentary mayhem going on in the outside world. Caribe introduced “The Underbelly Of The Beast” as an attack on far right governments everywhere, and particularly his native Brasil; it might just have been the political nature of the tune, but I couldn’t help thinking of Mingus (and that’s always a good thing). Despite the general pissed-offedness at politics, Bancroft hit a high note with a lovely tune called “Everything Is Going To Be Ok”. And in those minutes, it certainly was. 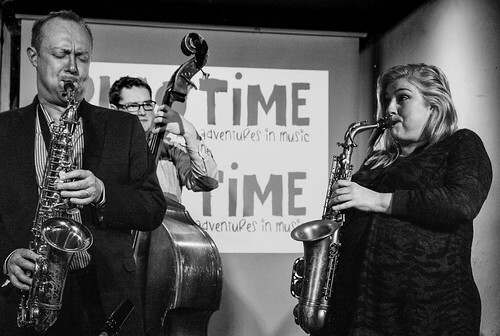 For me and many others, Playtime has become a regular fixture, a landmark in the Edinburgh jazz scene. It attracts an audience there to listen and appreciate the music. 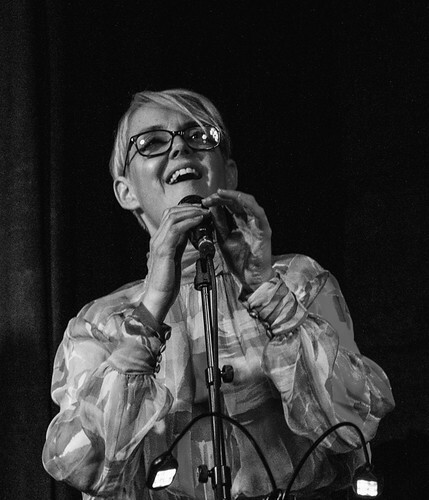 There’s a lot of humour in the music, too – the musicians want people to listen, but don’t take themselves too seriously. 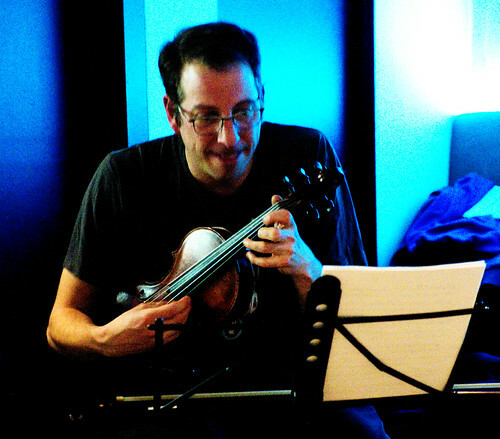 The dedication to new and improvised music may not be unique, but it is hugely welcome. 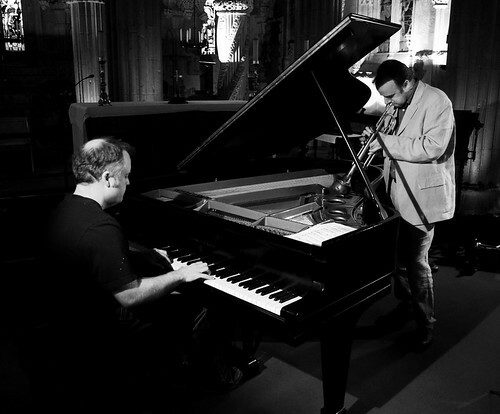 This entry was posted in Jazz and tagged Graeme Stephen, Mario Caribe, Martin Kershaw, Playtime, The Outhouse, Tom Bancroft on April 7, 2019 by patrickhadfield. 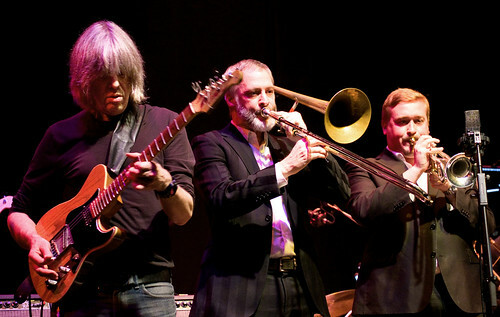 Last July, during the Edinburgh Jazz Festival, I saw the Martin Kershaw Octet premiere a new, extended work, commissioned by the festival. I was very impressed but something didn’t quite work for me. A couple of weeks ago I had a second chance to hear the piece, Dreaming of Ourselves. I’m so glad I gave it another hearing: it was a tremendous gig. It was the same line up, and, I think, the same programme. Dedicated to David Foster Wallace, the first half featured a quartet of Kershaw on soprano, alto and tenor saxes (I kind of wish he’d added baritone just to get a full house! 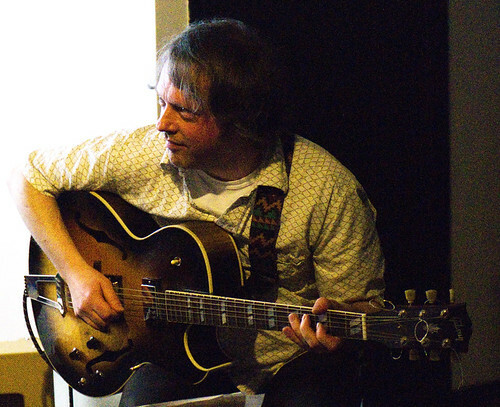 ), Paul Harrison on piano, Calum Gourlay on bass and Doug Hough on drums, playing older tunes of Kershaw’s inspired by Foster Wallace’s writing. 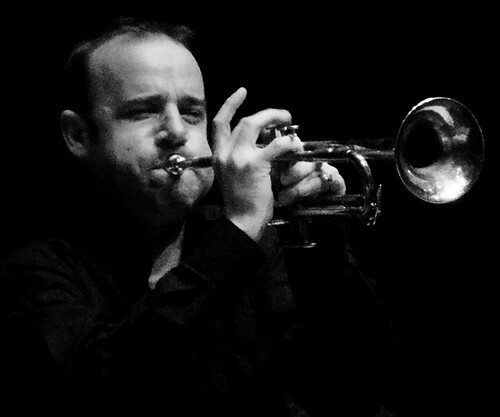 The second half featured Dreaming of Ourselves, a long, through-composed suite, performed by the quartet with the addition of Graeme Stephen on guitar, Sean Gibbs, trumpet, Chris Grieve, trombone, and Adam Jackson on alto sax. 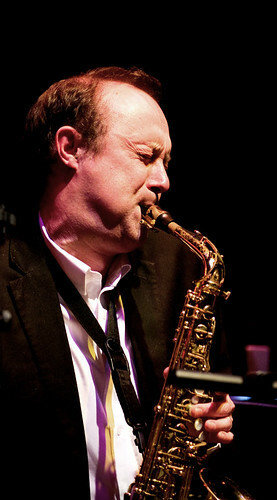 Martin Kershaw. Not at this gig. I didn’t take my camera! It was absolutely magical. I’m not sure what had changed (and it might be something as trivial as the venue, or maybe even my mood! ), but it seemed like the music took on a life of its own: the music was so much more than the notes on the paper and the eight musicians playing them. Chris Grieve (L) and Calum Gourlay (R).Not at this gig. I didn’t take my camera! It had a great depth. There were carefully controlled sections, periods of chaotic freedom, improvised solos and moments of deep emotion and intensity. A bit like the way Kershaw described David Wallace Foster, in fact. None of the musicians seemed to hold anything back; they were all excellent (and frankly must have been shattered at the end!). The whole performance shone. 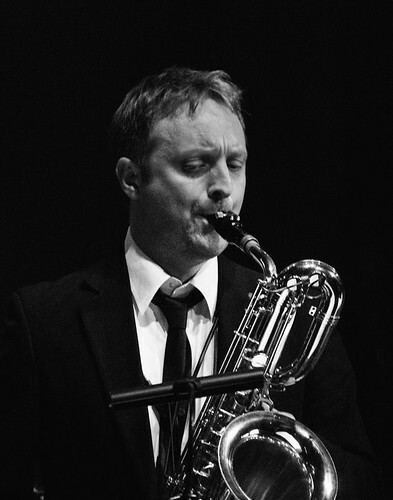 I bumped into one of the musicians later in the week at the SNJO’s gig (another superlative show – four of the musicians from the octet were in the SNJO that night) who said that they hoped to record the piece next year. So there’s that to look forward to! 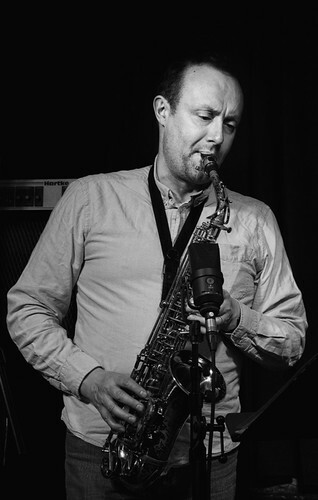 This entry was posted in Jazz and tagged Adam Jackson, Calum Gourlay, Chris Greive, Doug Hough, Graeme Stephen, Martin Kershaw, Paul Harrison, Sean Gibbs, Soundhouse, The Traverse on December 18, 2018 by patrickhadfield. 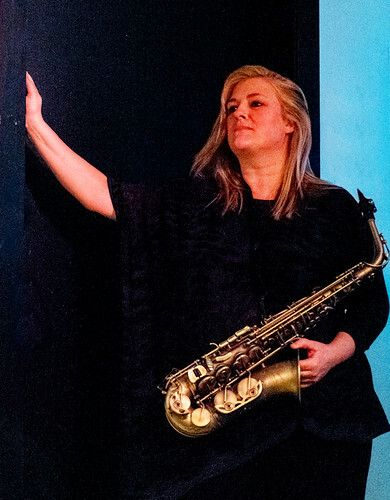 Becc Sanderson Sextet. Edinburgh, February 2018. 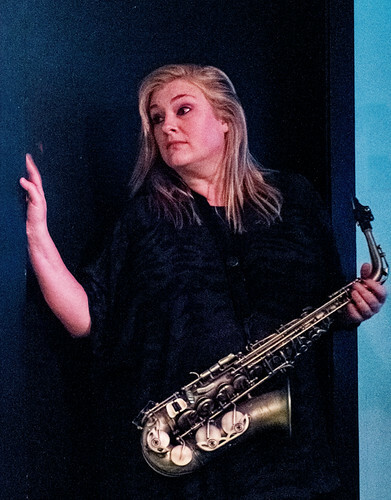 Intrigued by the idea, I went along to a gig: jazz arrangements of Bowie songs, the singing by Becc Sanderson and the arrangements by trombonist Chris Greive. This was a bit of an outlier for me: I don’t normally go for singers. The vocal lines were played more or less straight; the arrangements came over the other instruments. 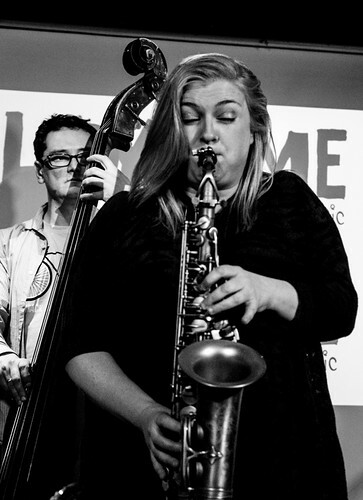 The first set was jazz standards, albeit standards that might not often get an airing – My Favourite Things with words rather than tenor, for instance. It was the second set that had the Bowie. And it was very fun – hugely enjoyable. Nothing too unexpected, a range of songs from the seventies and eighties. Space Oddity morphed into Ashes to Ashes; The Jean Genie and Time featured from Aladdin Sane (Sanderson stiffling a laugh at the frank language); a suitably lively Let’s Dance. Changes was an instrumental. Sanderson has a good voice, well matched to the (mostly) familiar songs. The arrangements didn’t mess around with the songs too much – a slight change to the phrasing, a nudge to the rhythm; and lots of space for the band to stretch out. The band reminded me once again at how much talent there is in Scotland. On drums was Tom Gordon, who I haven’t seen over here for ages (he based in Glasgow, I think). The pianist was Steve Hamilton, who was superb – there were moments where he changed the mood of a song with some subtlely placed chords. And Greive and Martin Kershaw made a fine front line. 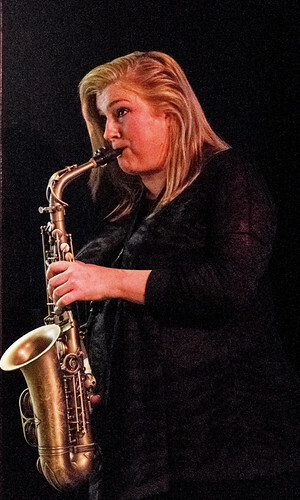 This entry was posted in Jazz and tagged Becc Sanderson, Brian Shiels, Chris Greive, David Bowie, Martin Kershaw, Steve Hamilton, The JazzBar, Tom Gordon on March 1, 2018 by patrickhadfield. 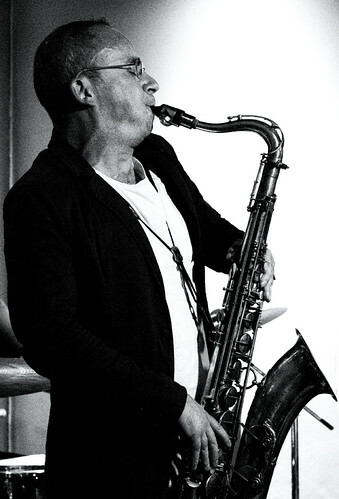 Colin Steele: “The Birth of the Cool”, and the Pearlfishers Quartet. 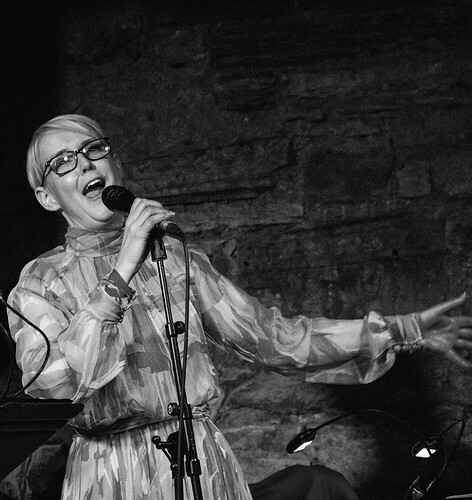 Edinburgh Jazz Festival, July 2107. 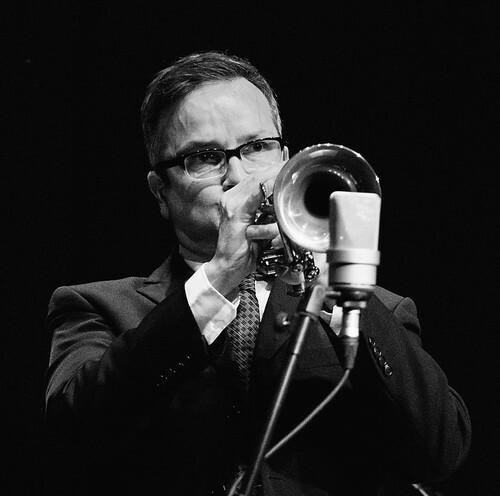 “The Birth of the Cool” was the first jazz record I bought, over thirty five years ago. It’s not my favourite jazz record – it’s not even my favourite Miles Davis record, not even in the top ten – but it is one naturally has a special place in my heart. 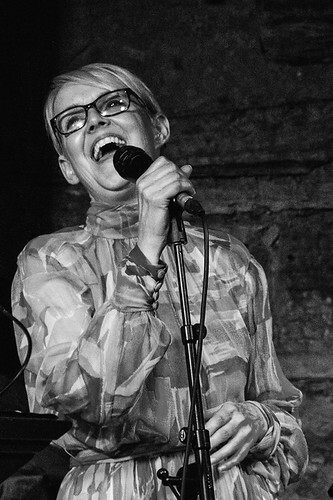 So when I saw a project to put together a band to play the album in its entirety live at Edinburgh Jazz Festival, it was a gig I had to go to. And a very special occasion it was. Colin Steele – not at this gig, but he looks the same! The trumpet seat was filled by Colin Steele, at competitively late notice, apparently; Martin Kershaw was on alto and Allon Beauvoisin was on baritone. 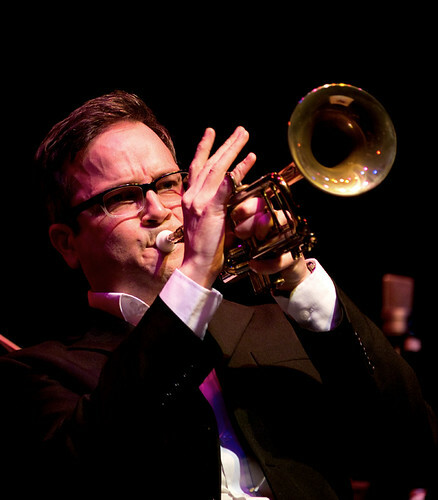 The other musicians making up the nonet were a younger generation: Alan Benzie on piano, May Halliburton on bass, and a trombonist, drummer, tuba and French horn players whose names I didn’t get – though it was pointed out that even the younger players were older than Miles Davis, Lee Konitz, and Get Mulligan when they recorded the original. The whole thing was directed by Richard Ingham, who didn’t so much conduct as dance around the rhythm. Recreating a historical record could easily slide into kitsch, but one faux radio announcement aside, this performance moist certainly didn’t. The music sounded lively and fresh, bouncy when it needed to be. It no longer has the capacity to surprise (as it once must, the first of Miles’ three big innovations), but it was a particular joy to be able to hear such familiar music live. 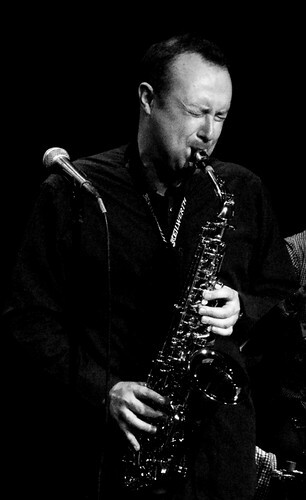 The following night saw Steele lead his own quartet, playing the music by the band The Pearlfishers, which they’ve recorded on the recently released CD “Diving for Pearls“. He might not have written the music, but Steele and pianist and arranger Dave Milligan made it totally their own. Steele said that he didn’t think hit his stride till the second set, but it didn’t show. Playing with a battered mute throughout, close into the mike, he was enthralling and beguiling. 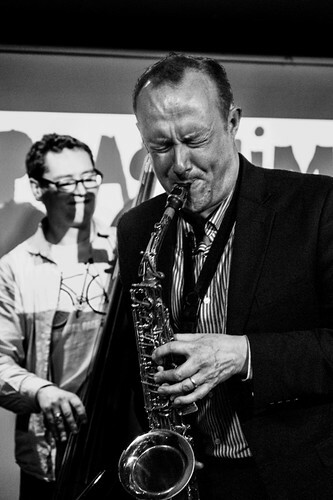 Colin Steele and Dave Milligan – again, not at this gig! It was a huge pleasure to hear Milligan, who seems to get better and better: some of his solos had an intensity that was gripping. 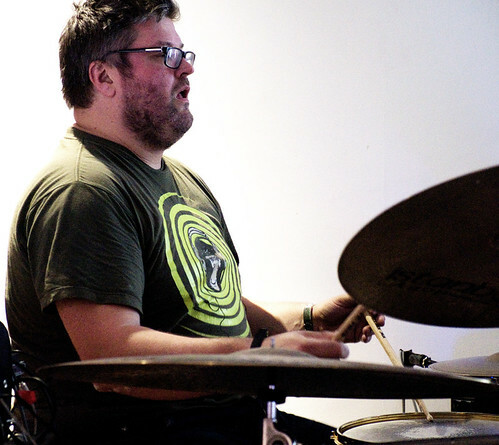 In the second half Steele took a break leaving the trio of Milligan, bassist Calum Gourlay and drummer Alyn Cosker to play an open, seemingly improvised piece – it would lovely to see Milligan do more trio work. 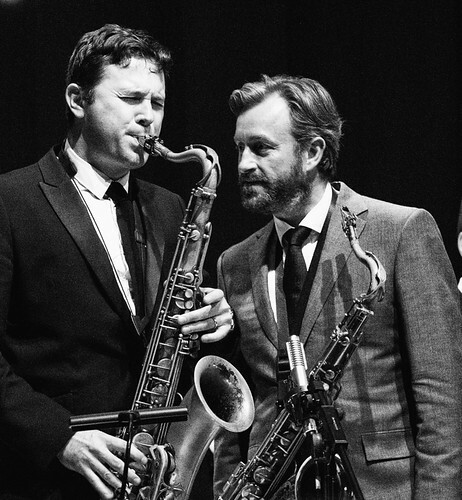 Gourlay and Cosker were full of confident competence throughout the show – it is easy to take them for granted, but they add a lot to the bands they play in. 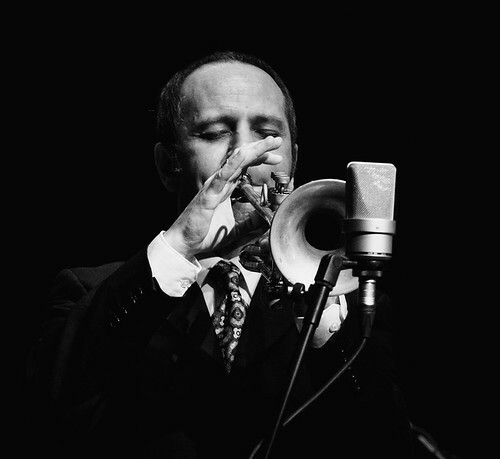 But it was Steele’s evening: literally muted but the notes flying from his trumpet. Milligan played a solo set in the final weekend of the festival. I managed to miss the first half of his set – I got the time wrong (a schoolboy error…) but what I did hear was wonderful. 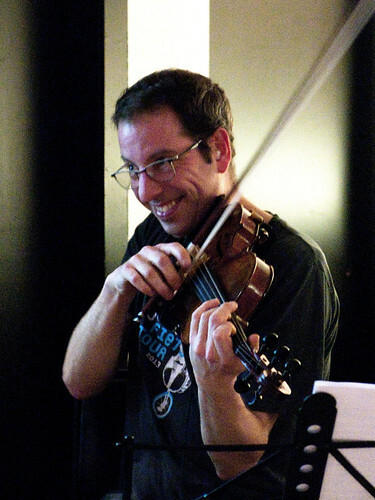 Largely improvised (he told a story of his young daughter asking what he was going to play, so he had to tell her he didn’t really know), he produced a variety of moods – energetic, contemplative, quiet, all engaging. This was music to get lost in, full of depth. 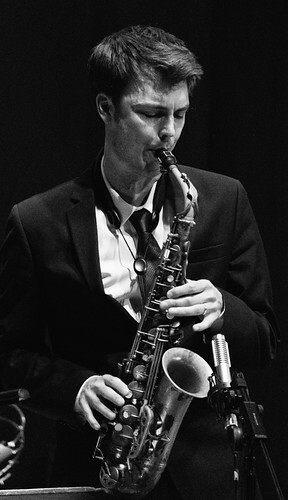 This entry was posted in Jazz and tagged Alan Benzie, Allon Beauvoisin, Alyn Cosker, Calum Gourlay, Colin Steele, Dave Milligan, EJF, Martin Kershaw, Miles Davis, Piccolo Tent, Richard Ingham, Rose Theatre on July 27, 2017 by patrickhadfield. 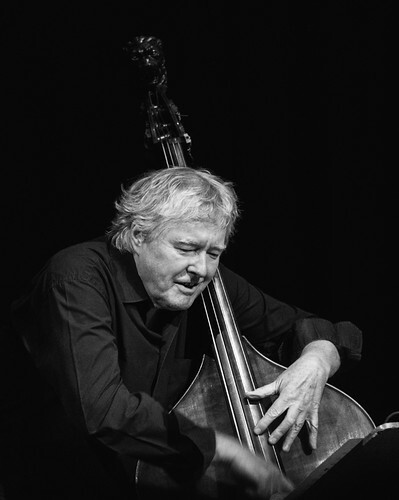 SNJO & Arild Andersen Play Mingus. Edinburgh, September 2016. 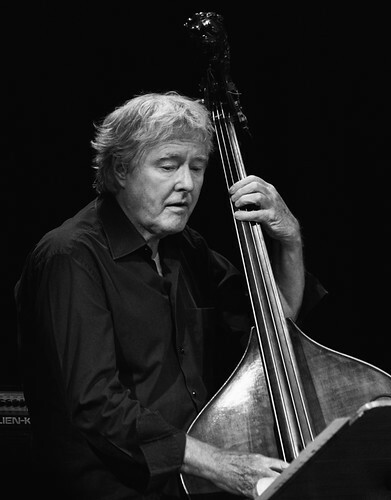 Arild Andersen joined the SNJO a bassist for the night, playing Mingus. 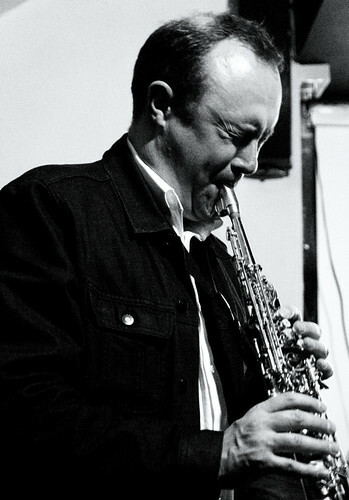 The band have played Mingus before – back in 2003, Tommy Smith said – and I loved it then, and I loved it now. And it seemed like they loved it, too. 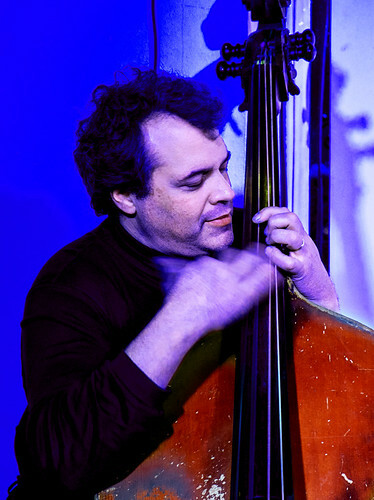 Andersen has played with the orchestra several times, but this time he was (more or less) just the bassist – the music was the star. A special guest bassist, true, and he played some great solos – but then they were celebrating a special bassist. The first half was brilliant. They warmed up with Song With Orange, not a tune I’m familiar with. An extended solo from Andersen lead into the bass riff to Haitian Fight Song and then it all kicked off. The synchronised riffing from the saxes, trombones and trumpets, band members hollering in between riffs, and some fast and furious solos. Fables Of Faubus followed, more riffs backing the soloists. 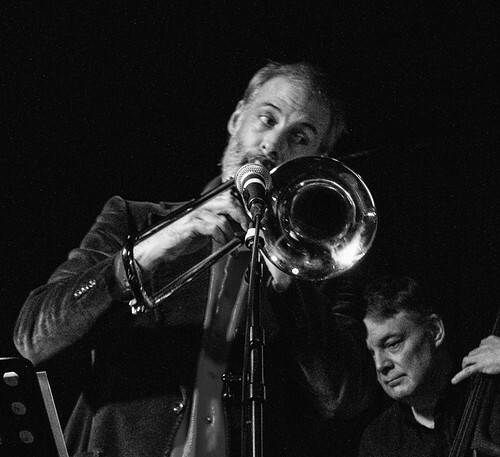 Tommy Smith and Arild Andersen played Goodbye Pork Pie Hat largely as a duet. Smith’s solo was remarkably powerful. 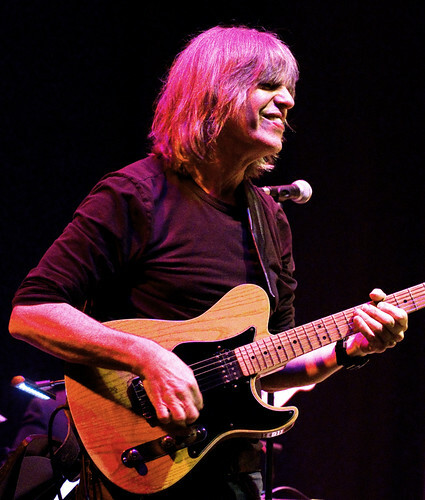 I’ve been seeing him play regularly since (I think) 1984 (a fund raising gig for his studies at Berklee and a small residency in a bar in Bruntsfield, if you’re interested), and somehow he gets better and better. It’s too easy to take musicians for granted, but once again I was reminded what world class musicians we have in Scotland. Not just Smith, mind. Soloist after soloist made their mark: Tom McNiven and Tom Walsh in the trumpets, Chris Grieve and Phil O’Malley in the trumpets and a whole slew of saxophonists – Martin Kershaw and Paul Towndrow on altos, with Kershaw also on soprano, and Konrad Wiszniewski belting out bluesy chorus after chorus. The first set was remarkable: exciting, high energy music. The second set felt a little more sedate, though only in comparison. 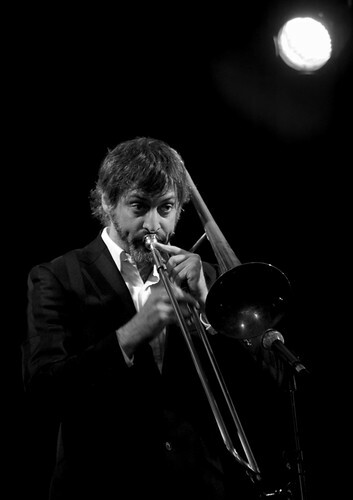 It opened with Moanin’, a feature for Allon Beauvoisin on baritone. Apart from the ballad Duke Ellington’s Sound Of Love, the other pieces were less well known. For the encore, though, the band were back to full on hollering form for Ecclusiastics. The high point was Wiszniewski and Smith trading choruses, each excited by the other’s performance (Smith a bit cooler, perhaps), until they joined together in a real tenor battle. A great evening, full of exciting music and solos. 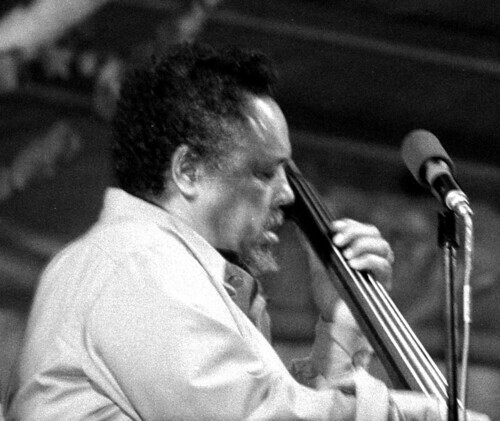 And a reminder if one were needed of the compositional skill of Charles Mingus: one reason his tunes work so well in a big band context is that he wrote for a large ensemble, but could only afford small groups. So he just made them sound big, instead. 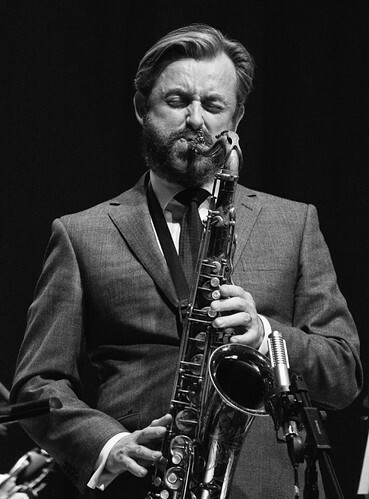 This entry was posted in Jazz and tagged Arild Andersen, Konrad Wiszniewski, Martin Kershaw, SNJO, Tom McNiven, Tommy Smith on October 1, 2016 by patrickhadfield. 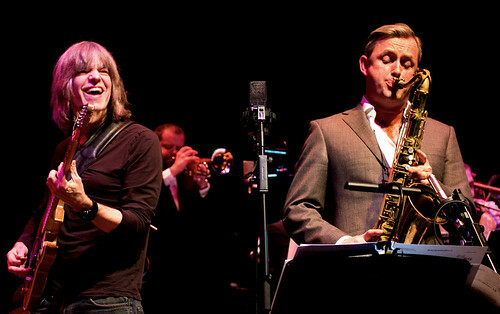 Mike Stern and SNJO. Edinburgh, February 2016. I didn’t have high expectations of this gig. 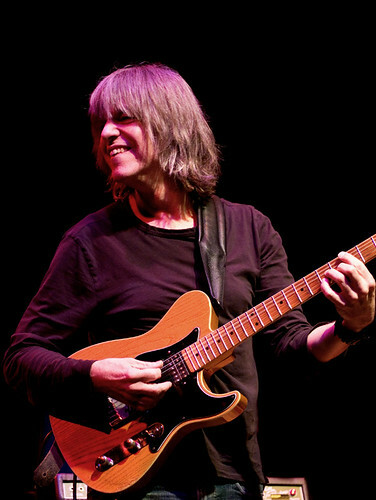 I saw Mike Stern with Bill Evans a couple of years ago, a very enjoyable gig, but I couldn’t imagine how his electric-jazz would translate to a big band. I mean, I thought it’d be fun, but nothing special. So much for my lack of imagination. 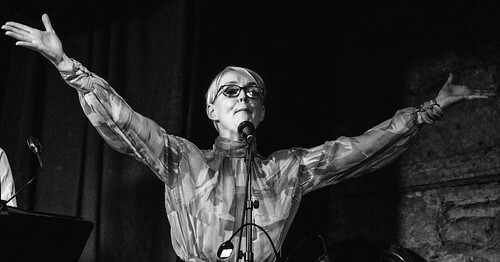 Because this gig was very special indeed – just amazing. If I see a better show this year, I will feel myself very lucky indeed. The band sounded just brilliant. No surprise there. But they worked perfectly with Stern’s electric guitar. 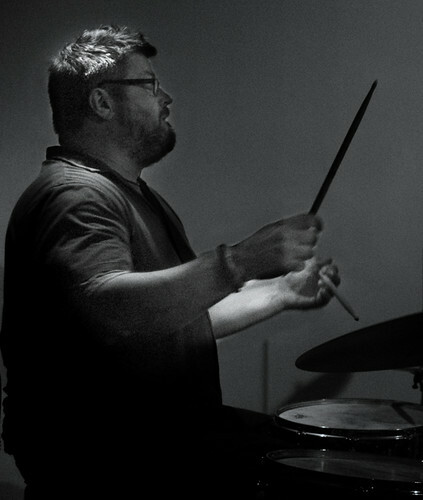 Drummer Alyn Cosker was given free rein – I think he’s better jazz-rock than swing drummer (though he didn’t have as much freedom as during the SNJO’s outing of Coltrane material). 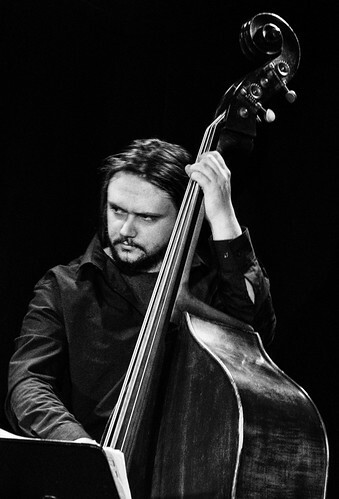 Bassist Calum Gourlay played electric bass as fluently as he does his acoustic. The soloists stretched out, but it was the band as a whole that sounded so good. I think a lot of that must be down to the arrangers, too – Geoff Keezer and Florian Ross are regular contributors, but I think there were some new names among the arrangers, as well. 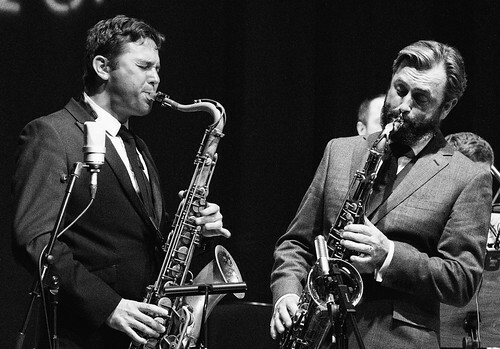 Either way, they turned Stern’s tunes into highly crafted big band pieces, showing off the SNJO at its best. And Stern sounded brilliant, too. He appeared to have a deep respect for the band, a huge understanding, never overshadowing them. He spent most of the evening with a joyous smile on his face. 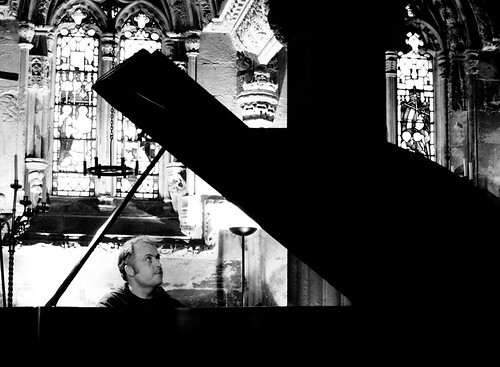 But perhaps the best moments were the three or four duets he played – short pieces, just Stern and another soloist. They were just magical. Aside from Marcus Miller’s Splatch, which features Stern on the SNJO album “American Adventure”, I have no idea what tracks were played. I mean, I could copy the list from the programme, but not knowing the music I couldn’t say which is which. Neither Stern nor Tommy Smith said anything between the tunes, as if they didn’t want to waste time talking when they could be playing. 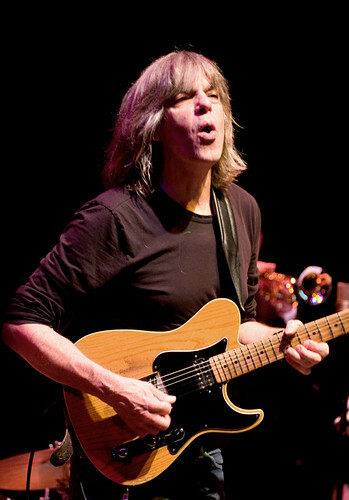 One tune flowed into another, Stern playing throughout, as happy accompanying as soloing. As he left the stage at the end of the second set, Stern exclaimed “well, that was fun!” Yes, Mike, it was. It was very fun indeed! 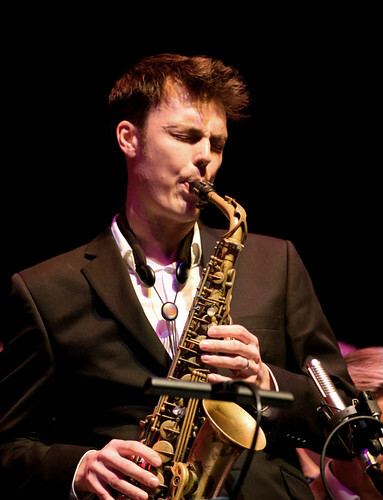 This entry was posted in Jazz and tagged Alyn Cosker, Calum Gourlay, Chris Greive, Lorne Cowieson, Martin Kershaw, Mike Stern, Paul Towndrow, SNJO, The Queen's Hall, Tommy Smith on March 17, 2016 by patrickhadfield. A Harp And A Viola at “Playtime”. Edinburgh, January 2016. The first Playtime of the year and the loft is a bit fuller than usual. 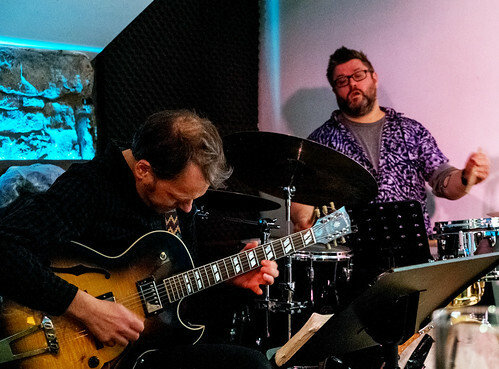 Tom Bancroft attributes this to the presence of two guests for the evening, harpist Catriona McKay and viola player Oene Van Gael joining regulars Bancroft on drums, Mario Caribe on bass and Graeme Steven on guitar. 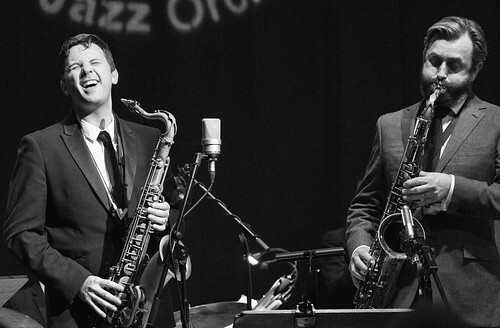 Van Gael is part of Steven’s new quartet, together with Caribe and Bancroft, so this might be an indication of what that group will sound like. 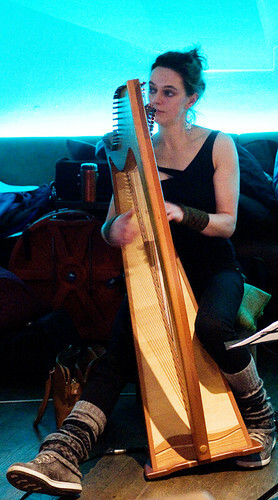 I’ve seen McKay several times in the last year: she’s clearly the go-to harpist for improvisation. 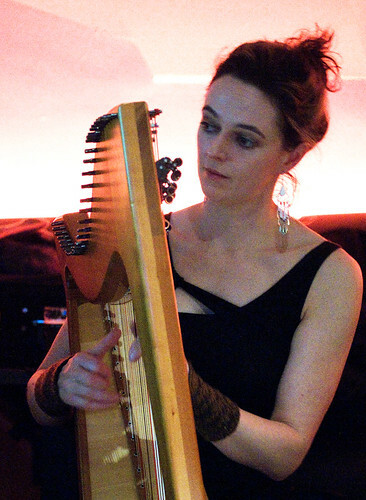 Actually she the only harpist I’ve seen improvising on the last year, I think – it’s not common a jazz instrument. Upstairs in the Outhouse, it fits well into the intimate setting. 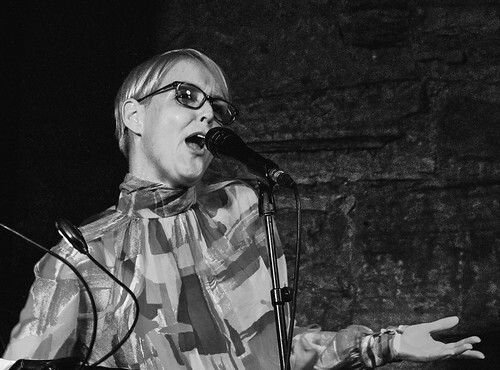 Together with Van Gael, she brought a folk tinge to music, reminding how close the jazz and folk scenes are in Edinburgh. Van Gael was an animated performer, mostly bowing his viola but often plucking it, occasionally strumming it like a guitar. McKay was more static by nature of the size of her harp, but equally energetic in her playing. Many of the pieces played were largely or wholly improvised, others written, such as a number by Bancroft I’d not heard before dedicated to his old car, the wittily titled “Fables of Fabia”. There was a lot of humour in the music too. 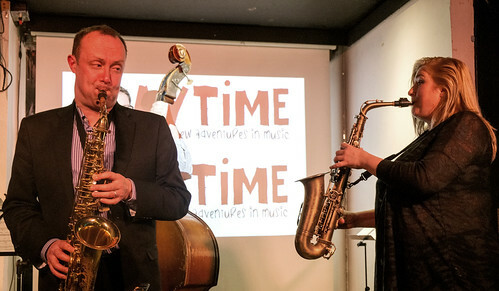 In the second half they were joined by Martin Kershaw, the other of the Playtime regulars, on alto. 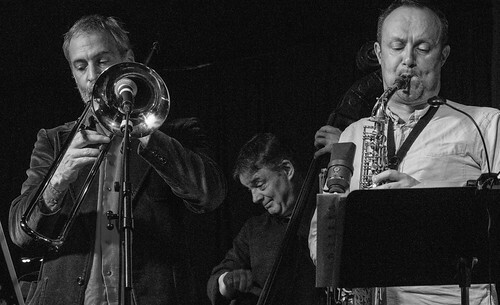 As a sextet, particularly with harp and viola, they brought a folk tinge to the music, reminding how close the jazz and folk scenes are in Edinburgh. 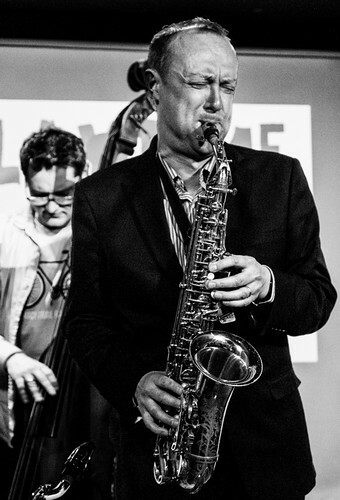 This entry was posted in Jazz and tagged Catriona McKay, Graeme Stephen, Mario Caribe, Martin Kershaw, Oene Van Gael, Playtime, The Outhouse, Tom Bancroft on February 1, 2016 by patrickhadfield.